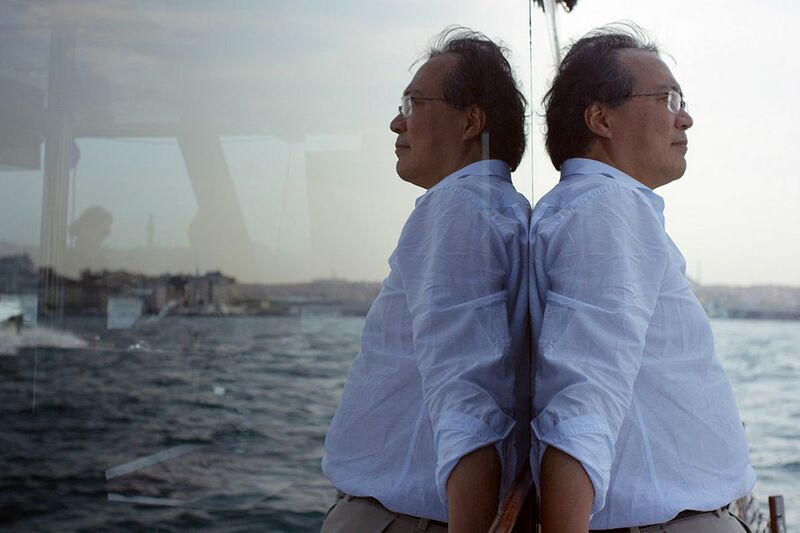 Cellist Yo-Yo Ma in the documentary "The Music of Strangers: Yo-Yo Ma and The Silk Road Ensemble." Typical of so much video associated with the beloved, charismatic cellist Yo-Yo Ma, The Music of Strangers is full of humanitarian philosophy and picturesque shots of artist and cello in exotic locales. But preemptive skepticism is best placed on hold. Morgan Neville's high-budget HBO documentary about Ma and the musicians in his cross-cultural Silk Road Ensemble captures all manner of real-life moments - especially as the initial kumbaya purpose behind the group's formation in 2000 becomes complicated and heightened with the geopolitics of our time. Backing up for a sec, the documentary spells out how Ma, now 60 and raised in America by Chinese parents, came so early and easily to classical music success that much of the rest of his career has been about answering the "Now what?" question. Ma also admits that the touring life was such that leaving home made him physically ill - his son Nicholas says he once thought his dad worked at Boston's Logan Airport - and left him looking for greater social purpose amid the rigors of fame. The idea of bringing together musicians from seemingly irreconcilable folk traditions was fairly new in 2000, though not radical. The high visibility of the Silk Road Ensemble helped legitimize the practice by assembling musicians from China to Persia to the U.S. for six CDs now (the latest is Sing Me Home on the Sony Masterworks label) and numerous concerts. In some ways, Silk Road has now been overtaken by groups such as Hesperion XXI that meld East, West, ancient, and modern with greater vision. But what makes The Music of Strangers a thoroughly worthwhile film is the stories of the individuals. Chinese pipa player Wu Man, seen with an electrified version of her instrument, has created a niche where none previously existed. Galician bagpiper Cristina Pato is a magnetic screen presence, starting with archival footage of her early years translating her folk tradition into rock-and-roll and then in later performances with Silk Road Ensemble. Syrian clarinetist Kinan Azmeh works with children in a refugee camp. Iranian kamancheh player Kayhan Kalhor becomes increasingly melancholic as he is repeatedly exiled from his home and maintains his marriage on Skype. "I don't know who writes the scripts for these revolutions," he says wearily, "but they all look the same and affect people's lives the same way." All of these stories unfurl with their own, refreshingly unrushed sense of time. And unlike some music documentaries, there's plenty of music, though the choice of high-energy excerpts might suggest that Silk Road Ensemble is mainly about ecstatic jam sessions. It's not. I do wonder if the group will have lasting impact. (The new album has an adaptation of Dvorak's "New World" Symphony that's puzzlingly awful). But the symbolic value of diverse musicians finding musically rich common ground is a crucial statement that can't be made often enough. Directed by Morgan Neville. With Yo-Yo Ma, Wu Man, Kinan Azmeh, Kayhan Kalhor, and Cristina Pato. Distributed by The Orchard. Parent's guide: PG-13 (brief strong language).